Our Primary School has two groups, each with 24 children between the age of two and six years. In our mixed-aged groups, the children learn from each other and meet each other with respect and joy. Everything is tailored to their needs. By identifying specific susceptibilities (sensitive periods), the pedagogues create opportunities for the individual development of each child. We continuously respond to the children’s natural thirst for knowledge. In this area there are many activities that are designed to refine the development of fine motor skills as well as the eye and hand coordination, while encouraging the child’s independence. 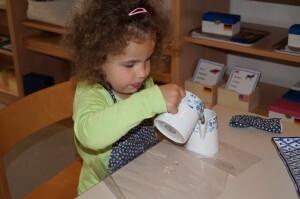 Polishing, cleaning windows, ironing and wiping tables are just a few of the exciting activities for the children. These materials help the child to perceive features from its environment (such as colours, forms and sounds) as well as to refine the senses. Each material isolates a particular property, so that the child can draw its attention exclusively on one factor / element. We start with spoken language activities in order to build up vocabulary and sound consciousness. We see writing as a form of personal expression and reading as a pleasure. Through successive materials, children discover writing and reading in a very natural way. 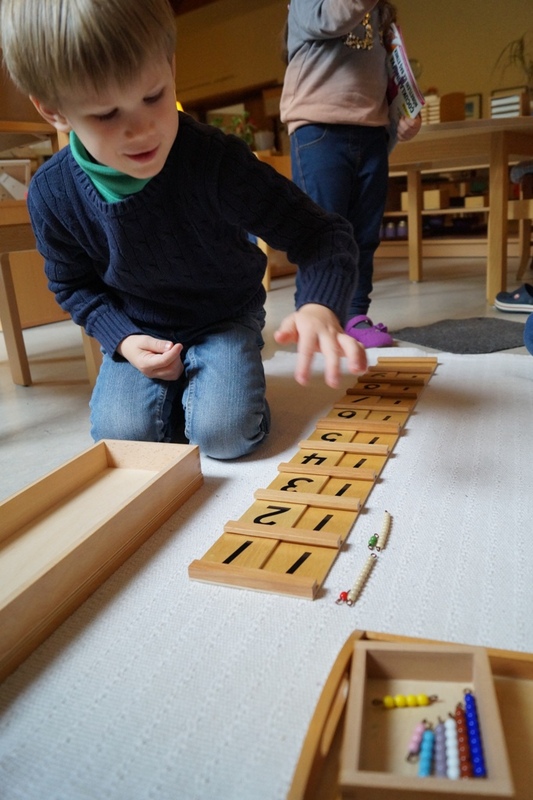 Math is an abstract concept and Dr. Montessori saw that children understand such concepts better by working with concrete materials. The child is first exposed to the concept of quantity and then to symbols. 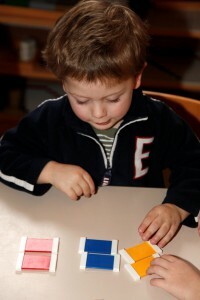 This is followed by the connection between numbers and quantities, which means that the child learns to understand that a certain amount belongs to a certain symbol. The children are made familiar with the four arithmetic operations through various materials. This gives them the opportunity to think abstractly and to memorize facts. Botany, zoology and geography are presented in the environment through puzzles, books, photographs and stories. Children are made familiar with the names of animals and plants as well as how to care for them. Globes and map puzzles help children to gain an understanding of the world. Through stories, photographs and celebrations children are brought close to different cultures. We offer children the opportunity to explore forms of musical and artistic expression. This can be done through composing their own music or exploring a variety of artistic mediums (paint, dance, collage, embroidery, weaving etc.) These offers are available to the children throughout the day. Our gym offers the children the opportunity to take part in weekly sport sessions. is looked after by us and the children together and serves both the free play and the exploring of nature with all senses. The outdoor area not only offers various working materials but also the opportunity for gross motor challenges.